COR®BON JHP is the original “HOT STUFF”! Back in 1982, our testing showed that most JHP (Jacked Hollow Point) ammunition would plug up with clothing and fail to expand in soft tissue. The typical JHP was passing through like hardball ammo causing little damage. For this reason, the original COR®BON JHP was designed with higher velocity than our competitors. Independent studies* have shown that the rapid energy transfer from the bullets violent and immediate expansion in ballistic gelatin has given our JHP a one-shot stopping power percentage of over 90%! The rapid expansion reduces projectile over penetration. Our JHP typically achieves 9”-15” of penetration. 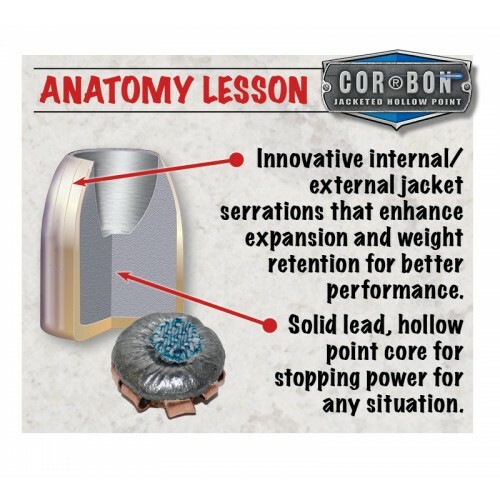 COR®BON’s line of high velocity JHP ammunition is still PROVEN to be effective and remains #1 in STOPPING POWER! The faster a bullet is traveling the more energy is created. Energy developed at the muzzle must be transferred or "dumped" into the target to be effective. Energy transfer is aided by bullet expansion. The higher the velocity, the more rapidly the expansion, the more effectively the energy is expended into the target. This explosive expansion dumps the available energy quickly, creating tremendous shocking power, and causes immediate STOPPING POWER! Stopping Power means SAFETY! Don't be misguided by those who claim that their products have some magical or mystical performance advantage or that they can make a reduced power load with increased performance. We believe it isn't possible! Jacketed Hollow Points are made with a gilding metal jacket and a soft lead core. The jacket is specially scored inside and out to ensure uniform and rapid expansion. Traditional hollow point bullet are economically priced and can be used to test the reliability of a handgun. Experts recommend that you fire at least 200 hundred rounds of your carry load to make sure it will function every time when you need it. This bullet mushrooms in the traditional sense to typically double diameter. The jacket and lead peel back to the bullet base.